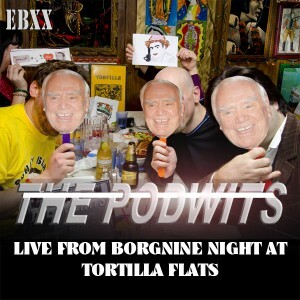 The Podwits take the show on the road and record LIVE from the 20th annual “Borgnine Night” at the legendary Tortilla Flats in New York City! The proprietor of the bar, Andy, sits down and discusses the history of “Borgnine Night” and the cult status it has now achieved. Will Dion ever be able to top this episode’s “Borgninian Moment of the Week”? You’ll just have to listen to find out! All that and a preview of an upcoming Podwits EXCLUSIVE interview. And a special thanks to www.paulpix.net for providing not just the beautiful cover art for this week’s cast, but for shooting the evening for us!